A Dictionary of the Pathan Tribes on the North-West Frontier of India, Prepared by the General Staff of Army Headquarters, India in 1910. This dictionary provides detailed classification about all Pathan Tribes north of the Kabul river and west of the Indus. Tribes between the Kabul and Kurram river including the Turis. Tribes between the Kurram and Gumal rivers, and those on the Derajat border. Pathan tribes south of the Gumal, and Tribes, such as the Shiranis, which occupy country on both sides of the border between the North-West Frontier Province and Baluchistan. The present Dictionary is the reprint of the old Dictionary which was published for the first time in 1910 under the title A Dictionary of the Pathan Tribes on the North-West Frontier of India. Though with the division of the Indian sub-continent into India and Pakistan in 1947, India is no longer politically connected with the old North-West Frontier, which is the home of Pathan Tribes. The strategic importance and the history of the region is vitally connected with our past and as such the same cannot be ignored or under-estimated. Right from the dawn of history, the Khyber Pass and other mountain of North-West Frontier have served as the gateway to hordes of invaders beginning with the Aryans and Alexander the Great and ending with Ahmad Shah Abdali. The invasions also took place in the reverse direction during the Sikh rule which extended upto Kabul. The Pathans are the inhabitants of this strategic region. The average man’s notion of Pathans is that they are a very aggressive people and vindictive in the highest degree. The Pathan Tribes are often found perpetually at war with each other. Every tribe is supposed to be engaged in internecine wars, every family has its hereditary blood feuds and every individual has personal foes. Every tribe has a debtor and creditor account with its neighbour, life for life. But these are common traits of a race which is subjected, for countless generations, to endless foreign invasions. Thus historical forces have also contributed in shaping their character. We should also take note of the fact that a Pathan has his code of honour which he observes strictly. It imposes upon him three chief obligations to shelter and protect even an enemy who comes as a suppliant, to revenge by retaliation and to give open-handed hospitality to anyone who may demand it. And of these three, perhaps the last is the greatest. Such a virile and colourful race needs to be studied with careful interest against the background of historical forces. 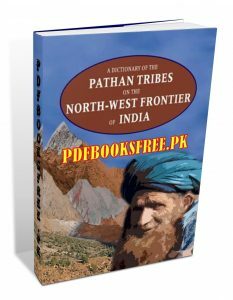 Thus a Dictionary of this kind, with detailed classification of the various Pathan Tribes on the North-West Frontier is bound to be an asset for all those who are interested in the historical research of this area and its people. The Dictionary of the Pathan tribes is now available on Pakistan Virtual library for reading and download. Check out the following links to read online or download full dictionary in Pdf format for offline reading and references.